Everything is evolving always. That holds true for the design of cars, the flavor of potato chips and fly fishing. Consider what has changed in the sport even from when you started casting. What new rods have been developed? How many different flies have been tied? And how has your own technique improved? It’s all evolution. As is the case with every sport, the more you practice the better you can become. This is especially true with your nymphing ability. 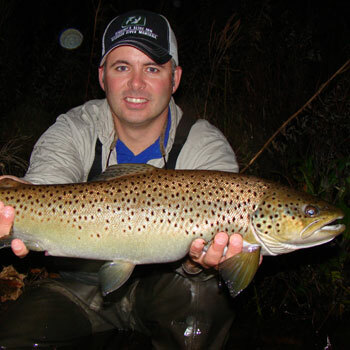 For the new flyer fishers out there, nymphing is the technique by which you are attracting fish below the surface with aquatic insects that are in their underwater stage of development. A fly fisher like Aaron Jasper is all about nymphing. Even though Aaron’s “day job” is as a teacher, he still manages to clock in an impressive 200 to 250 days of fishing each year. Clearly, this is a job we’d all like to have! Over the years, Aaron has become quite the connoisseur of the European style of nymphing. As one of the founders of the Trout Predator Online fishing community he is all too happy to share what he’s learned over the years to fellow anglers. Nymphing came into the sport almost 70 years ago with fly fishers like Frank Sawyer, George Harvey and Joe Humphreys. Back then they were casting with a simple copper wire or a pheasant tail nymph and plenty of patience. It’s quite a challenge to evolve a sport, but that’s just what those fly fishing pioneers did. It wasn’t long before nymphing became the kind of rewarding challenge that was synonymous with fly fishing. “You go to the stream. You get out of the car, you high five your buddy, and you're like, ‘Yeah, we’re going to catch a lot,’” Aaron explains. “Then you go to the stream and you're like, ‘Oh boy, what happened? What happened between the car and the stream?’ Well, the fish. The X factor is the fish and that’s what the most exciting thing is.” Aaron recommends you learn something about every single type of nymph fishing there is so you can match your technique with the kind of water you’ll be fishing in. As an example, to make the distinction between European nymphing look to the leader first. Czech and Polish nymphing techniques are evenly matched with a short leader while the French and Spanish work nicely with the same longer leader. Then you begin to get into the details. For instance, with French nymphing you’re working more with a more upstream presentation with two nymphs. The chances of landing a strike on the first cast are along the lines of scoring a perfect game in bowling or shooting a hole in one in golf: It’s a rarity, but that doesn’t stop you from chasing the thrill.